Merry Christmas to everyone and happy holidays! 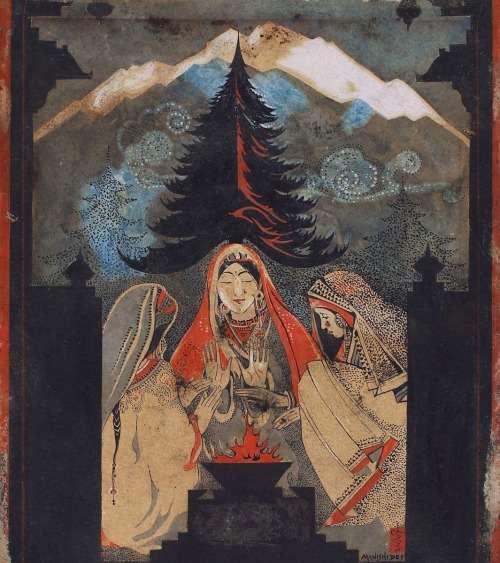 This entry was posted in 1960s, 20th century, Art, Asia, Bengal, Costume, Culture, ghaghra, indian art, Indian Dress, Indian Women, Paintings, regional styles, vintage art, Vintage Dress, vintage sari, Women and tagged 1960s, art, Bengal, Christmas, delhi art gallery, fir, fire, Manishi Dey, vintage, vintage art, Vintage India, winter. Bookmark the permalink. Merry Christmas, Anu. And thanks for your lovely posts throughout the year. Thanks Betsy! Wish you Merry Christmas too!